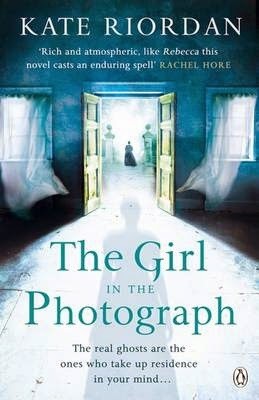 The Girl in the Photograph is an atmospheric historical fiction novel by Kate Riordan that captured my interest from the very beginning. Set in Fiercombe manor, this is the story of two women, Elizabeth in the 1890s and Alice in the 1930s and we hear from both women in the first person. When Alice moves to Fiercombe Manor, she becomes interested and perhaps even obsessed with the life of Elizabeth, previous lady of the house. Alice starts to unravel Elizabeth's story, and discovers it's not too different from her own. Both women feel oppressed by the social standards and expectations of the time in which they live; Alice by her mother and Elizabeth by her husband, giving the novel an almost gothic atmosphere. Early comparisons to Kate Morton seem to follow every review of The Girl in the Photograph, and I have to agree. I'm a devoted fan of Australian author Kate Morton, and although Kate Riordan is a UK writer, The Girl in the Photograph, definitely feels as though it could have been written by Morton. The way in which Riordan splits her story into two time periods, with the character in the present (in this case the 1930s) pulling at threads of the past and feeling that the ghost of time and the essence of Elizabeth is never too far away is strongly reminiscent of Kate Morton's style. Far from being critical of the similarities in style, I feel I've discovered a new favourite author to add to my list and I eagerly anticipate the next offering from Kate Riordan. P.S. If you're into combining music with your reading, then I suggest listening to Johnny Belinda or Hanging On by Active Child when reading this novel. They seem to go hand in hand. Thanks Debbie, great to hear it's now on your TBR list, let me know what you think when you get to it.